This stretch of the Wye is characterised by tensions between the wild and the ‘civilised’. The wildness of the peaks above Elan were tamed ( to some extent) by the Corporation of Birmingham when their valleys were flooded. 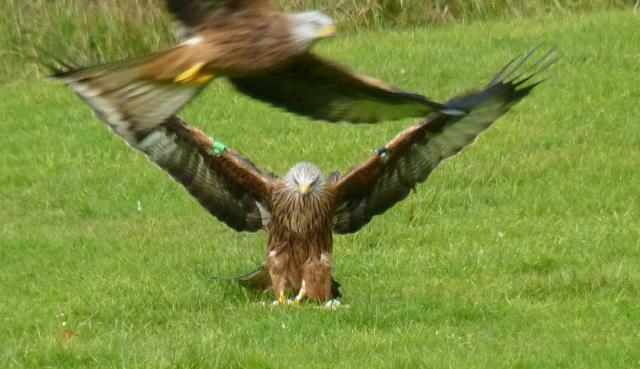 The original wildness of red kites, indigenous raptors, was crushed by gamekeepers and farmers. They have come back in great numbers with a very successful conservation programme – and provide a tourist spectacle at various feeding stations. The Wye itself tumbles through rocks and forests, but not far west is the faded gentility of Llandrindod Wells – a venue for many a bureacratic meeting involving North and South Wales. A stretch of contrasts, and a feeling that the wildness is waiting not far below the surface for man to slacken his grip. Leaping Stiles provides maps and summaries of walks in mid Wales and if you search in the Rhayader area you will find 12 walks. Two walks, one around Crugyn Ci, Esgair Perfedd and Penygarreg Reservoir, and the other describing a circuit around Gorllwyn are available from the Walking Britain Site. The long distance Wye Valley Walk provides some information about walking along the Builth Wells to Rhayader stretch.